Ice-cream is a big affair in Italy, nobody can deny it. We may travel whole kms out of our way to taste the best ice-cream. Till not long ago, I had to fly home for it, now I’m a bit more lucky. 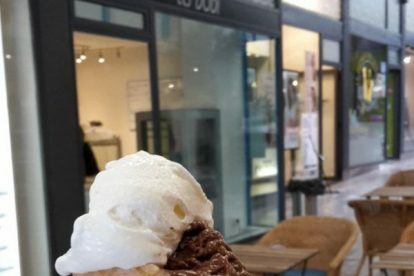 Les Dodi was opened in July 2017 by Edoardo, a 22 years old guy from Rome. He wanted to become a lawyer but he started working in a kitchen to pay for his studies and ended up understanding his real love is food, but mainly ice-cream. So he left everything and moved to Brussels, after graduating at the ice-cream school in Italy of course. He learned French and opened his gelateria. All his gelati are home-made from fresh ingredients sourced by him directly. Every few days he comes up with new flavours that he creates in his workshop behind the counter. His latest hit flavour is the basil fiordilatte. I still have to try it but I know already I won’t be disappointed even though I’m a puritane when it comes to ice-cream: chocolate and cream are my top flavours! Now, don’t hesitate, head there and try any of the flavors, you won’t be disappointed!